Kelvin is from RM6 (Rocky Moon 6) of the planet Arcturi. His age is unknown, but it is known that his species is composed of a vast colony of "kelvite" microorganisms. Kelvin is capable of sentient thought and is able to rapidly move and re-form into various shapes. With an extreme dislike for Jennerit explosives, Kelvin is fond of ice sculpting and extremely cold weather. Kelvin generally goes where Miko goes and is always sympathetic to "protecting the less fortunate". How did Kelvin's character come to be? 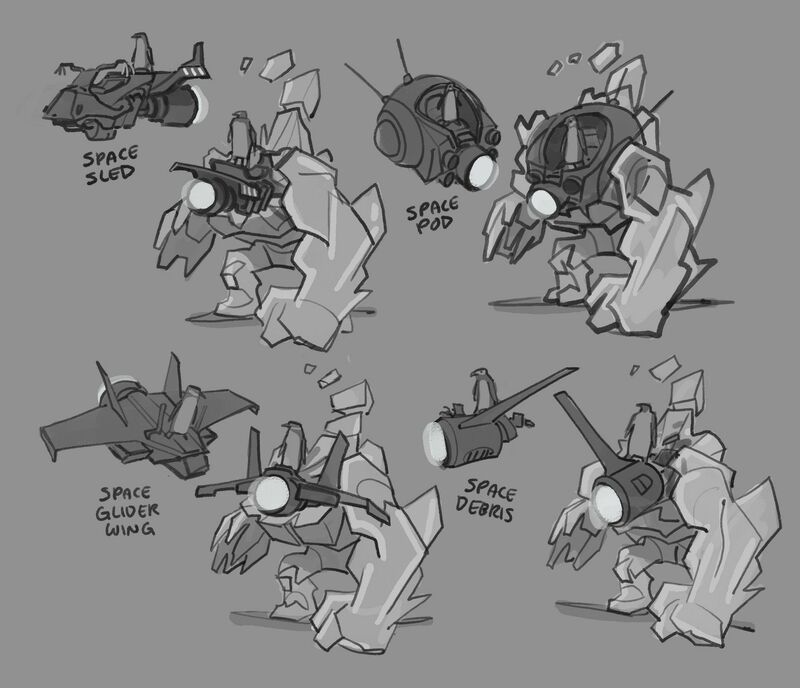 The idea for Kelvin was created back early last year, when the team was pitching ideas for characters every day. 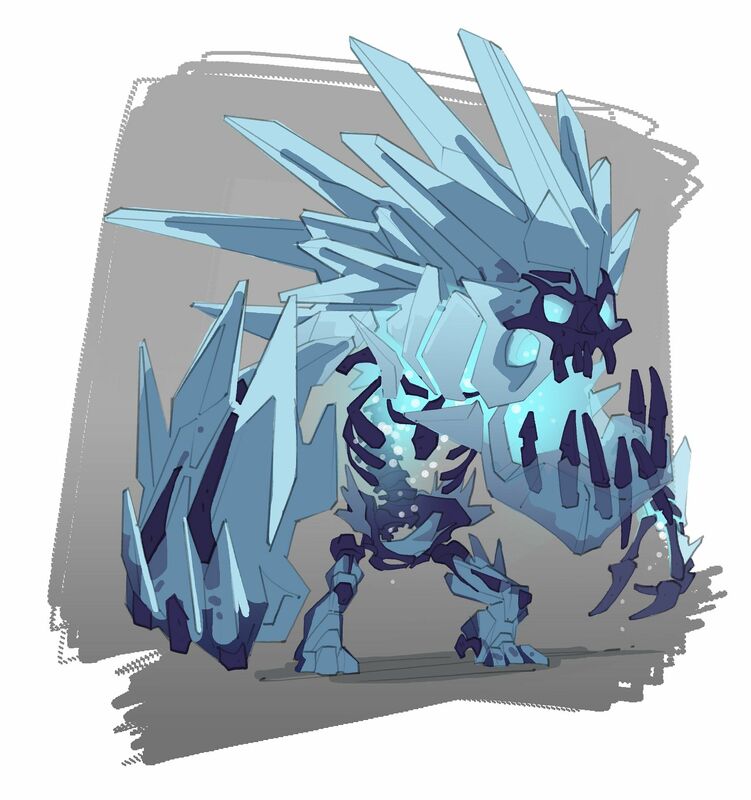 Originally Kelvin was pitched as an alien trapped inside an ice golem, where the two entities would combine powers. The idea for an ice character was one everyone liked, so that element was pulled out for further exploration. Fun fact - at around this same time, the idea for Toby was being pitched as well. Since penguins and ice go together like Montana and Oscar Mike, an early concept of Kelvin incorporated Toby. Instead of having an alien inside the ice golem, Toby's crashed space glider was lodged in Kelvin's body. Can you tell us a bit about his abilities and skills? Kelvin is a large melee character with amazing crowd control abilities. He also has the ability to grow his health pool incredibly large and with certain helix and gear choices, Kelvin can reach health regeneration numbers higher than any other Battleborn. There is a new feature coming down the pipe that will make these numbers even more fun to track; a stat lover's dream! Sublimate is one of Kelvin's starting abilities and is his bread and butter ability for stunning enemies and doing a bit of damage on each touch. His ultimate, Ice Wall, is another great crowd control ability that can block the paths of enemies and friendlies alike. If placed directly on an enemy, the enemy will also be stunned for a short period of time! Kelvin can regenerate his health reactively, but he also can protect himself proactively, similar to Reyna in that he gains shield strength every time he completes any skill. This gives Kelvin a damage buffer before hitting his health pool which comes in really handy! How does Kelvin fit on a team? Kelvin fits in as a great crowd control pick and tank depending on the team's needs. When paired with a healer in competitive play, Kelvin can be a nuisance to the enemy team. If focusing on crowd control look to his helix for choices that reduce comedown times for Sublimate and Ice Wall. Consider bringing in one cooldown piece of gear as well. Kelvin can start as a strong tank out of the gate at level one with his “Density” mutation which grants an extra 360 maximum health. However, to reach his full tanking potential, focus on landing his Chomp ability and build your maximum health pool as large as possible so you can soak up the damage for your team! How do you play Kelvin? Tank and support characters are two of my favorites, so I’m a big fan of Kelvin. I play Kelvin aggressively as an initiator while also keeping tabs on the battlefield, looking to help a teammate in trouble. After pinging my focus target, I love diving into a group of enemies, stunning them with Sublimate to initiate a team fight and watching as my team pours in to help pick off the enemies. Landing a well-placed Ice Wall that prevents enemies from escaping will get your team pumped! I also have fun trying to reach new records with my maximum health pool, which the game tracks so you can share and compete with your friends! If you want to be the best Kelvin possible, concentrate on completing his lore challenges and earn his hand crafted legendary item, Plasmite-Infused Plating. The other gear I tend to use with Kelvin are attack speed and damage items. In capture mode though, use white gear as the matches end quickly. The team did a great job on Kelvin. I love his gear set, his first and third person model and effects, and the personality he provides through his animation and dialog. Give him a shot, he's fun to play! Simple as A-B-C: Always Be Chompin! Don't overlook Kelvin's alternate attack which does an area of effect damage. Its rate scales off of attack speed and can be very effective! Be careful attacking enemies with stuns, push backs, and high maneuverability. Remember: that as Kelvin you're not out to score kills, though they do happen occasionally. Focus on setting up your teammates and you'll be racking up assists!